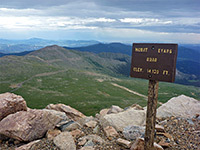 At 14,264 feet, Mount Evans is the 12th highest peak in Colorado, part of the Front Range along the eastern edge of the Rockies, and so visible for many miles across the flat plains further east. Like another major fourteener nearby, Pikes Peak, the mountain is notable for the road that leads all the way to the summit (or at least to within 134 feet of it), enabling visitors to experience tundra landscapes well above the treeline, an environment usually accessible only via several miles of hiking. The 14 mile scenic drive is mostly over treeless slopes, also passing a lake and extensive meadows with many species of wildflowers. Wildlife includes bighorn sheep, mountain goats, marmots and pikas, plus the occasional black bear. Without stops, the journey only takes around half an hour. 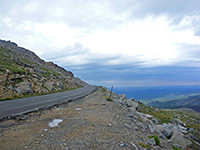 Although broadly similar to Pikes Peak Highway, the road to the top of Mount Evans differs in several aspects. The drive starts at an already high elevation of 10,650 feet (cf. 7,500 feet) and the journey is rather less steep - most is quite gently sloping, traversing grassy slopes beneath several subsidiary peaks. The location is more remote, since although quite close to Denver, the access road (Hwy 103) is narrow and bendy, crossing an otherwise little traveled region south of I-70. Hence fewer people visit, and the mountain is less commercialized; there are no facilities on the summit apart from the parking area (plus an off-limits observatory), so the drive is generally more peaceful, whilst being equally scenic. The upper portion of Mount Evans Scenic Byway, beyond the Hwy 103 junction, is usually fully open between Memorial Day and Labor Day - May to September - but for 24 hours a day, while Pikes Peak Highway is kept accessible all year though closed at night. The east end of bendy Hwy 103 begins at Bergen Park near Interstate 70, but the majority of people start at the west end, in Idaho Springs also on I-70, where the route is signposted to Mount Evans. The first few miles run along the nearly flat floor of the valley of Chicago Creek, followed by a steep climb into the wooded mountains, gaining nearly 2,000 feet to a junction at 10,650 feet beside Echo Lake (and close to a campground), where the summit road forks off southwards. The scenic drive is winding at first, climbing from the entrance station (fees $10 in 2015) through the upper reaches of the forest and above the treeline to Mount Goliath Natural Area, a small protected region that contains ancient bristlecone pine trees as well as many flower species. A short trail crosses the hills. 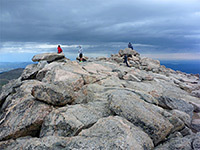 Goliath Peak rises above, at the north end of a ridge that extends south to Mount Evans and includes three other summits (Rogers Peak, Mount Warren, Mount Spalding). Beyond here, the road is relatively straight, crossing tundra and rocky hillsides, with a big drop-off to the east. There is no fence, and the land in many places falls away right at the edge of the tarmac. The road stays on the east side of the ridge, reaching a parking area after 9 miles beside Summit Lake (12,830 feet), where another short path leads to the shore. The surrounding boggy flats are underlain by an area of permafrost, believed to be the southernmost occurrence of this in the US. 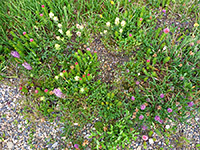 These moist conditions are ideal for many species of Alpine plants such as king's crown, queen's crown, alpine clover, American bistort and elephant heads. The lake sits in a deep, glacial cirque, enclosed by curving, rocky slopes on three sides, with Mount Evans due south and Mount Spalding to the west. The road is damaged in the vicinity of the lake, and narrower beyond, though still suitable for all vehicles under 30 feet in length. The next section is straight once more but then begins a series of tight switchbacks that continue all the way to the summit. The slopes become increasingly rocky, covered by jagged, mottled, reddish-grey boulders. The road ends at a small parking area beside a stone structure, formerly a restaurant, the wooden parts of which were destroyed by fire in 1979, resulting in its abandonment. A closed track leads to the observatory, operated by the University of Denver, while a quarter mile path ascends through granite boulders to the actual summit just to the west. As expected, the mountain is cold and windy even in midsummer, and temperatures are below freezing most nights of the year. Views extend a hundred miles or more across the plains, and encompass innumerable other peaks to the north, west and south.